At the original authorship of this article JP:TG’s canonical status was dubiously listed as being within the vein of the S/F canon. Since Jurassic World was released the matter has become harder to figure out. This article helps to smooth over the retcons made from the game though. An update in the future will discuss how the game could still fit with Jurassic World in the mix. Please take this piece as a combination of opinion and inferences based on facts. This quote was key in our determination of the game’s status originally and still casts doubt on its relationship within the S/F canon. What steps did Telltale take to ensure an authentic Jurassic Park experience? Was there any collaboration or discussion with the filmmakers or film studios? Delivering an authentic Jurassic Park experience has always been a top priority for the team. We worked closely with Universal, and found we had very similar ideas about what’s best for the license. The story of our game is new, but it’s woven into the events and canon of Jurassic Park. We worked hard at getting the look and sounds of the dinosaurs exactly right. The dinosaur sounds are so iconic, I was dreading the thought of recreating them. Thankfully, Universal delivered an amazing volume of the original dinosaur sound effects. Canon separation is something that is paramount in the Jurassic Park franchise due to the fact of the contradictions present between media as it adds depth to the story line that we know and love. Why is this a big deal? It is imperative to any story to maintain cohesion between media and control contradictory elements via retroactive continuity whenever contradiction is present. Further it is supported by Michael Crichton’s own words while in an interview on the “Jurassic Park Phenomenon” on the Behind the Scenes features of the DVD/Blu-Ray that the novels and films are separate continuities from one another. There is also evidence to showcase the comics, junior novelizations, and video games being separate and functional continuities due to their contradictory nature to the films. Jurassic Park: The Game, looks like it could be the game changer for all of this though. The burning question at this point is whether or not Jurassic Park: The Game is actually in-line with the film continuity. While the debate in our Encyclopedia Project forum is still going on about the exact level of canonicity and jurisdiction the game itself has overall. The general consensus is that it is in the S/F family and our true first example of Expanded Park media that supplements to, instead of subtracting from, the franchise. The game is not without problems as there are inconsistencies and we’ll briefly go over those first and then look at what the game truly adds to the Jurassic Park mythos afterward. Gerry Harding – Similar appearances/Slight changes. 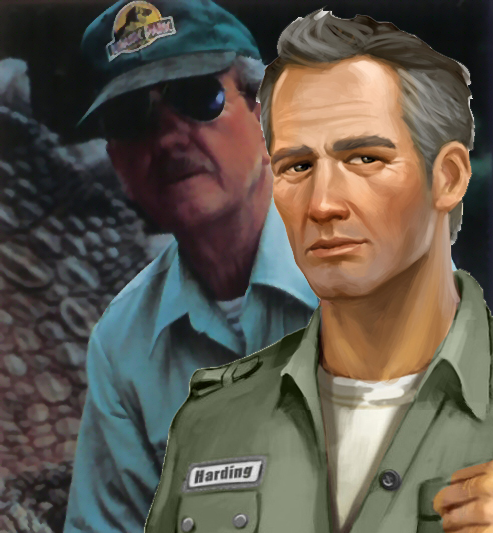 Gerry Harding in the film was played by Jurassic Park producer Gerald R. Molen. The film appearance has one thing working in favor of it; Gerry is concealed by a hat and and sunglasses. So this makes his look “disguised” but the facial structure though on his video game counterpart – while similar – is more lithe. The appearance in the film is a bit-part; so establishing character or a direction of a character is left up to the game. For characterization we have little to nothing to go off of for the film-continuity family. The game has total control in regards to this on that note. This brings us to the contradiction possibly in appearances. In the game Gerry Harding is shown mostly having a similar, but not exact, likeness as his film counter-part. Above is an image comparing the two and be the judge for yourself. The mustache, lack thereof, in the game is not fully explained sadly – but allegedly from TellTale reps on their forum “he shaved”, but we do have a conundrum here involving the sequence where we are first introduced to Jess and Gerry in Episode One and it is indicated this is before Gerry goes to treat the sick Triceratops, before the arrival of Drs. Grant, Malcolm, Sattler, and Donald Gennaro. So the issue here is the possible passing of time, the sky looks to be either early morning. The Jeep we see through Jess’s binoculars is being intended for use by Drs. Grant, Malcolm, and Sattler from the first film, but it remains stationary. As to when this scene in particular takes place during the first film is open for debate, but it is suspected before our film heroes arrive on the island. These issues could probably be identified as a flub and therefore within a reasonable error margin, as they are not completely altering continuity of events, just the appearance is slightly different of the character, but we know overall who the character is. 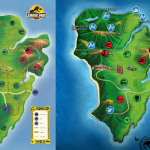 Isla Nublar – Road Issues, Possible Fourth Dilophosaurus Paddock, Map Update, and Answers to Questions Asked A Long Time Ago. 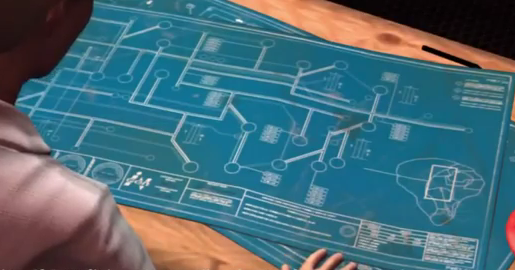 The biggest thing is the new map TellTale made on their site in an effort to promote the game. Allegedly Joel Meine’s work was put to use here. Now I want to mention while the JPL map is based loosely around Joel’s efforts; the original Nublar map done by Joel was inaccurate as it included elements from various canons (Novel/Film/Junior Novelization) hybrid along with the Jurassic Newsletters, which while offering a decent amount of information are mostly doomed to be a real-world bridge to promote the film. Presently at the time of writing this the newsletters are under re-evaluation and may have the locations that were suggested on the current JPL map, removed (Iguanodon Inn, Golf Course, etc.). Joel was not that far off with his original map, but the problem comes from the fact that Joel added in a Southwest paddock grouping that wasn’t there, also the land in the southern peninsula was wider when compared to a topographical map from the film from the control room, further it lacked the proper location of the Gallimimus paddock as the paddock was erroneously added to be combined with the Brachiosaurs and Parasaurolophus territory. It may sound as if I am unappreciative of Joel taking the time he did to invest in creating a functional map; it’s quite the contrary actually! Joel did a wonderful job and Joel even – as a result – got us thinking about maps and overall how to make a functional map and he deserves honest credit for that. TellTale based their map off of the original brochure map featured in the film, with a few additions/alterations here and there. By no means does it serve as an exact scale for where things are, but it is considered a somewhat general guide of where things/events are placed. Submitted for the approval is the original brochure map with comparison of the TellTale map. TellTale makes some adjustments to the position of the paddocks, additional areas, and the tour road. This isn’t completely off, really, and locations are generally within the same area, save for a few exceptions which make it a bit more consistent with the Paddock shutdown map. So in essence this is within the error margin we originally determined back when we did our own Isla Nublar map of “generalization”. 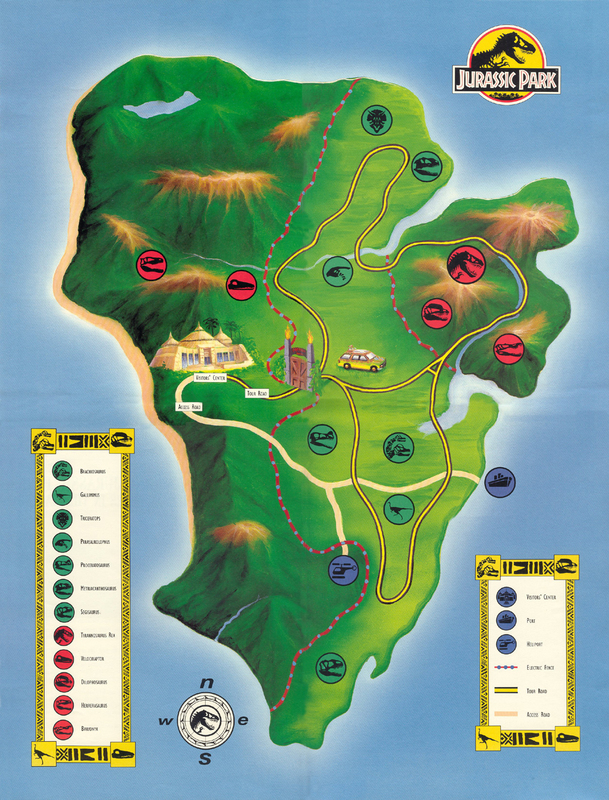 The Nublar map will always be a point of contention from the way the roads and locations are listed from the official prop brochure and the actual representation in the film as a result of the contradictory nature, and error between props. For something more specific you would look at the maps shown in the control room, which is the perspective we take when it comes to the production of our map. 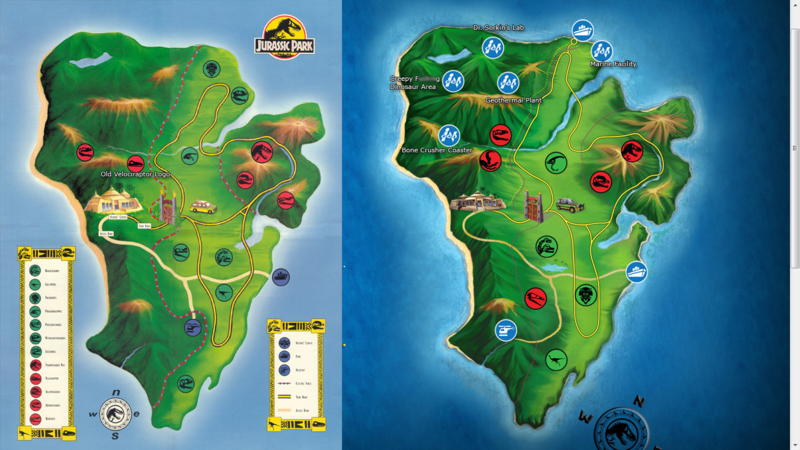 These are the proposed changes, in addition to the current Nublar map. The only way for Nima’s prologue sequence to make sense is she had to have crossed a road in a panic (running west) and then got chased by the creepy Troodons (running North) before being ran up an incline, over a cliff, then falling down, and being hit (or narrowly missed) by the Hardings in the spot with the red dot. Gerry decides it’s best for Nima to be treated back at the Visitor’s Center, so they make the long trek back by taking Service Roads, coming onto the same road that Muldoon and Ellie took to the abandoned tour cars, before forking (additional road added) to go onto a tour road not utilized by the tour program just yet. So why the deviation? For one if they were to be speeding off with an injured woman in the car it would show a really bad impression for Hammond’s tour group if they ran into them. Further, this would allow Gerry, Jess, and Nima to avoid running into the Rex Attack sequence almost akin to a narrow miss. Now, yes, I did say there is an additional service road added in to where the Tyrannosaurus paddock is and this is because this is the only way this scene can make sense as the other brings us out RIGHT where the tour cars are, which at this point Gerry and Jess are ignorant as to what’s going on as seen later when they approach the baby Triceratops, Bakhita, outside of her paddock. We’re not new to the concept of adding a trail or road in here and there to these maps, but we try not to be careless with them – it has to functionally work for the scenes to make sense when there is no other alternative. We had to do this for Nedry’s sequence in order for it to make sense, too! Now, one of the roads we once considered a service road is now a tunneled tour road. The reason for these two roads is actually a matter of inconsistency between the more rounded road here and the more zig-zagged road here (which is what we used for our original map). This leads into the Tyrannosaurus paddock and may effect the Rex’s known range somewhat (not a big deal). So now we reach the cool part: What Telltale had ingeniously done though is give us a means to explain one of the biggest head-scratchers ever on the film, and that’s on how the tour cars got turned around. If the round-about to turn the cars around is in the Dilophosaurus Paddock (This is a secondary paddock as the primary is just after the entrance. This secondary Dilophosaurus Paddock comes from the Shutdown Sequence, while the primary is on the CD-ROM Tour map), why did Grant, Gennaro, Malcolm, and kids go back through the Rex Paddock? The answer is that converted service road to a tour road with a tunnel on it. Hammond’s Visitors finish seeing the Sick Trike, the cars pulled forward, then reverse direction to go back around the way they came. So here we sit, a means to an end that properly explains something that was a bit convoluted on the original Control Room map. As a result the Sick Triceratops sequence is moved further north, which seems to fit with the topography we were anticipating as the original placement was a general educated guess. This works better for, also, quarantine reasons for the Sick Triceratops from the rest of the herd also given their now over-protective nature of the alpha. We also had to move the Desalinization Plant further north, which is expressed by Dr. Sorkin in the game as being “a cover for the Marine Facility where the project itself would move into Phase B”. More about this later. In addition, the North Dock is shown to more or less be the arrival/departure point of visitors to InGen’s Jurassic Park facility, which makes sense for there being two docks – one a supply dock and the other a Visitor dock – even if it is borrowed from the novel. Now this brings us to the next point since the East Dock is primarily the point to receive supplies/personnel for the island. Do some of the service roads hold an electronic tour track for transport/maintenance access of vehicles? 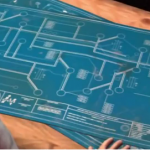 Let’s note that in the beginning sequence of the game when Nima narrowly misses the jeep after being bitten by the Troodon we don’t see a tour road track, but later when it shows us the point of view of Jess and Gerry we see a sort of track involved. Not a major deal, but this is probably an oversight. Also, during the scene between Jess, Nima, and Gerry on the road where Gerry is checking Nima to see if she’s alive, the “road track” around them disappears and re-appears in the next sequence. I would surmise if there is a track there it’s maybe used to move the cars around in case of a break down, maybe? Or some service roads had a tour track for that reason? 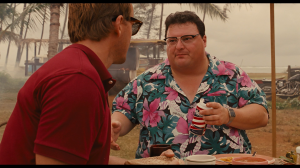 Keep in mind this is also allegedly near or about at the same road Dennis Nedry took to get off the island. Why didn’t we see a track in the film? Considering the road as part of the same route as Nedry took does mean we have to ponder ‘why no tour track?’ Visibility in heavy rain is limited and we do have a tropical storm going on, so the water flow could have obscured this from our vision. A more tedious analysis of this sequence is planned, but for now we know the Hardings were en-route to the dock and this is an approximate of where the scene could have or did take place. 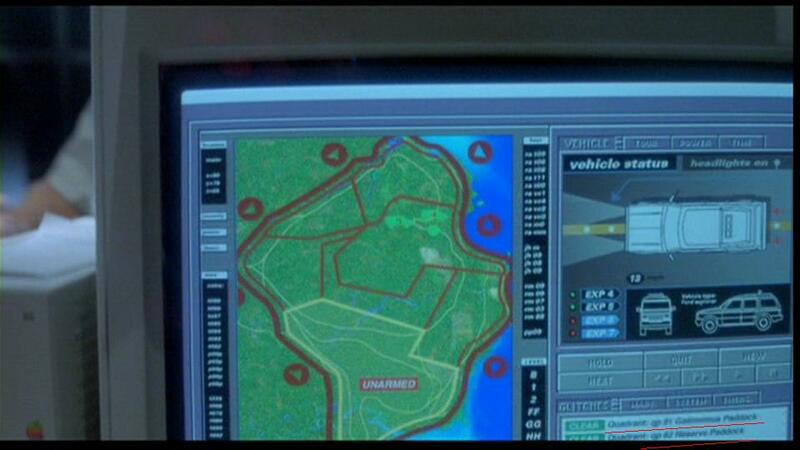 Further, we may have an additional Dilophosaurus paddock, possibly. Near Nedry’s death after Miles and Nima cut through the jungle they reach an electric fence of sorts. There is a sign after they cross over the fence (and out of their field of vision) that indicates possible Dilophosaurus territory. This is a tricky retcon aside from the ol’ “throw another Dilophosaurus paddock next to the tour road” thing we’ve been doing with the previous other scenarios when there’s a contradiction in Dilophosaurus placement. (See “Shutdown Sequence“, “Tour Map“, “CD-ROM Map“, and “Film” for examples of road placements/contradictions and Dilo Paddock Placement.) A fourth is not that far of a stretch since a tour road is near that location and there’s some space that could be accounted for in regards to the jungle river cruise, but again this sign could also be a warning to workman that “said carnivore” is nearby and that way if they see the animal they can easily identify and report the issue to their superior. We do need a further investigation into this matter, but for now this fourth Dilophosaurus pen is on debate status and ergo not included. The Scenic Point on the tour indicates a possible rest stop. Topography shows it overlooking an area where you see mountains and a fence behind. Placement could be by the Dilo paddock unless there’s another rest station up further north we didn’t know about. There’s a fence behind them during this sequence. This could fit where our rest stop is and a perimeter fence, but it’s in a proximity that should be close to the Marine Facility. I placed it here, also, due to the fact that you hear the tour car mention Dilophosaurus as well, and I would presume that’s an indication they’re by the Dilophosaurus paddock. I have added the tunnel that the car comes out of, but what’s of interest is that the car comes from the opposite direction compared to where we saw the original tour – this still could be a reversal of the tour program at some point. Other points of interest will also be added in time, but for now this is strictly preliminary. Some may see the roads and topography issues here and ask, “what do we believe?” The problem is, even the film suspends the belief on topography and it doesn’t really match up totally to the topographical map of the island that is known from the control room. Player experience in the game is also taken into account here as well, as it may seem shorter for more skilled players to make it through the scene. We base our decisions on good old fashioned intelligent thought and deductive reasoning at this point, attempting to make logical conclusions, in essence, from what we see. The roads and topography are close, but not exact when you dig too deep down the well in a manner of speaking. It’s not the production design as a whole, but all the same, when it comes to the films and the game, they have these same inconsistencies as a byproduct of attempting to establish themselves loyally. The thing with the JP film-canon is that it functions on a sense of generalization. “This generally looks like it works,” as it were, and we keep this in mind a lot. Arnold’s Incredibly, Super Long Name? Apparently Samuel L. Jackson’s character, John “Ray” Arnold, has one super long name. TellTale, as an oversight possibly, has given Ray Arnold the name of “Ray Allen Arnold”. Evidence comes from Sorkin’s journal is when she is discussing the Geothermal Power Plant. In essence this makes this now officially, when taking The Lost World Boardroom scene into account, “John RayAllen Arnold”. Not a big issue, but this is a bit of an oversight with an easy and possible quick retcon by saying he’s got a super-long name. Ironically the name “Ray-Allen” can be hyphenated as well, too. So we now have Troodon and Tylosaurus added to our species list. How is this explained? Simply put, InGen has to authorize anything that goes on the list. This concept was explored in the third film to explain the sudden appearance of the Spinosaurus. This is the first time, EVER, someone has bothered to explain the appearances of additional animals on Isla Nublar with an actual logical reason that can be bought with it though. The comics, published by Topps, neither explained nor bothered to show the reasons why for additional animals. Of course, at the time, Topps was under the impression that Nublar was the only island with dinosaurs on it. In-Universe, InGen/Hammond apparently has to authorize animals to be on the specimen list for the park, and the embryo available in the Visitors Center Genetics Lab for mass production. This introduces a concept for additional animals on Nublar and mentions that some animals could be introduced in Phase B time (e.g., Mosasaurus) while some animals like Troodon have been completely quarantined with intention of being retired. A question of coloration comes up in regards to Sorkin’s Parasaurolophus population that she released that are basically “Lysine Contingency Free” and possibly able to breed. What we do know about the females from the first film is they have a very dull greyish/blue/green appearance and some have stripes and blotches on them with alternating patterns. The camera angle is wide in this sequence and the animals are a blur as a byproduct in this scene making identification a hit and a miss. ILM snuck the animal in, basically, for the first film after the sequence involving a lengthier appearance was dropped. ILM made this same decision to sneak the Pteranodons into The Lost World for the ending of the second film. The Parasaurolophus in JP:TG are considered to be males of the species, brought to Nublar from Sorna by Sorkin to be studied in quarantine and isolation. This is due to their coloration being a mixture of what we see in TLW and JP3. It would appear, also, that the JP3 Pteranodons are the inhabitants of choice for Isla Nublar, which could imply a similar genesis to that of the Cearadactylus from the novels, seeing how the behavior is similar. This would make it likely that the Pteranodons in The Lost World could have possibly, in fact, been produced by InGen for a safer “more theme park friendly” environment. This speculative jump comes from certain elements of the game covering theme park compatibility as seen with the Troodons not being included in the island’s inhabitants list, and the Mosasaurus pending approval as well in some capacity. The argument of park compatibility can also go towards the Velociraptors as well in regards to the differences between V. nublarensis and V. sornaensis. The Velociraptors do make a return appearance and, supposedly, these are from Sorkin’s stock as well. It is alleged in Sorkin’s journal that she kept a private breeding population in the former Raptor Paddock where Grant and the kids discovered the egg shells. It’s also implied that some may have been in the Quarantine Pens as well. Sorkin also alleges, due to the shortcuts involved in the cloning process, the InGen Velociraptor is actually V. mongoliensis, but it is the size of Deinonychus from the mutation. 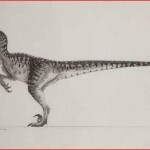 There is some issue with this when considering the preliminary skull analysis on the JP Velociraptors, and comparing them to Deinonychus and Velociraptor respectively. The preliminary report we are working on shows more of an appearance akin to Deinonychus. 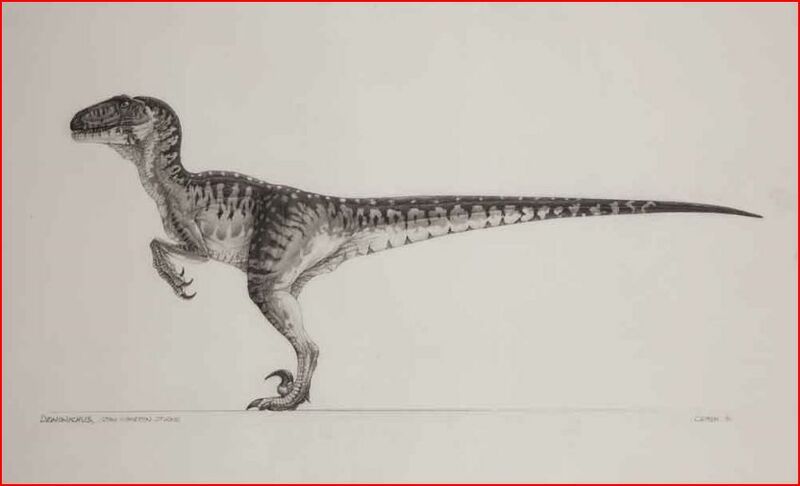 Further, the image above is a piece of concept art mentioning the Velociraptors in Jurassic Park as Deinonychus as well as showcasing a black and white view of the coloration pattern intended for the film. The physical appearance otherwise is the same as the film counter-part. As for the retcon, I believe in this case it could be Sorkin’s bitter resentment towards Wu and InGen itself entering into the situation, but that is a possible theory at this point to counter a bit what’s stated in Sorkin’s journal. It’s also a logical jump in speculation, given Sorkin’s attitude and disposition she would blame everything on Wu due to his short-cutting on the cloning process or the various. For now the Velociraptors in Jurassic Park are to still be recognized as Deinonychus. Apparently Dr. Sorkin was Hammond’s original creator of the animals before he brought on Henry Wu. Dr. Sorkin had shown she could extract DNA from the mosquitos trapped in amber. How does this work? There is the fact that it’s never been explicitly stated in the films that Wu created the animals actually, so no contradictions exist here. Essentially the story goes InGen needed to maintain control of their creations (lysine contingency), speed up the time to replicate the animals to get the park open (utilizing frog DNA), and they also knew Dr. Sorkin would not cooperate on either of these points. 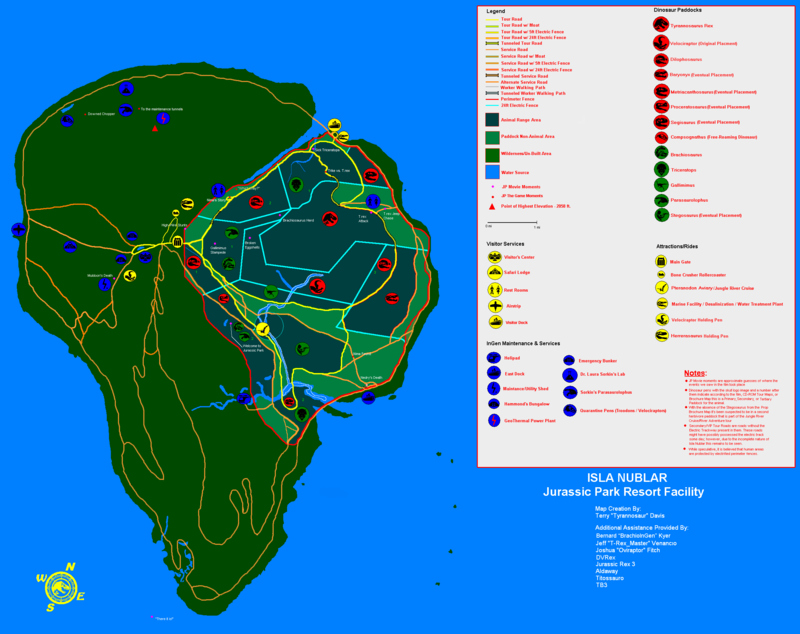 It is also shown that Dr. Sorkin had different plans for Nublar and turning it into a true biological preserve instead of what Hammond intended as a theme park. Sorkin also further wanted to spend time and also a load of company money painstakingly restoring the animals with a full genome. InGen and Dr. John Hammond, as a solution to Sorkin’s insistance, brought on Dr. Henry Wu to basically complete Sorkin’s work. As a result of Wu’s tampering, the animals are not true dinosaurs and do have anomalies present in their physical appearance and behavior much to Sorkin’s displeasure. Dr. Sorkin says in her journal she is working on fixing the mutations caused by Wu’s negligence and correcting a counter-reaction to the lysine contingency in addition to the issues with the mutations. The new time line will look like this. 1982-1987: “Fifteen years ago John Hammond had a dream.” John Hammond begins laying the ground work for International Genetic Technologies out of Palo Alto, California with further locations and operations in Europe and San Diego, CA. (From InGen Handbook part of the JP:Deluxe Edition). InGen is established and built up a rapport in the global economy in 1985 before moving to clone extinct animals. Hammond hires Dr. Laura Sorkin for a proof of concept and shows InGen that extinct DNA can be extracted from mosquitos trapped in amber. Hammond establishes Isla Sorna as a research outpost for production of the animals and San Diego for the theme park location due to the world-famous San Diego Zoo being local to it. Hammond also begins funding Grant’s research at some point . Wu is eventually brought on and begins working with Sorkin. Wu’s successful with cloning dinosaurs in an efficient manner beating out Sorkin’s time bids. Sorkin becomes resentful and a pain to InGen from this point on. 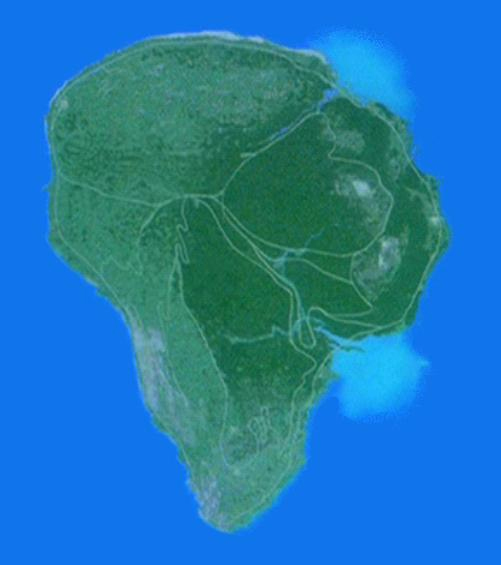 After producing a reasonable stock of dinosaurs (possibly) InGen/Hammond decides to abandon the concept of Jurassic Park San Diego and look a little closer to an island near the operations in the South Pacific. 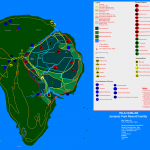 1988-May/June 1993: Operations move to Nublar in approximately 1988 after the San Diego idea for the park is abandoned and began leasing Nublar from the government. Subsequently, as a result of leasing Nublar from the government Oscar, Nima, and their tribe are removed from Isla Nublar by the Costa Rican government. Sorkin still remains on with InGen and gets her field lab on Nublar in an effort to show she can still be of use by correcting Wu’s mistakes. Building continues on Isla Nublar until Jophery, a gatekeeper, is significantly injured (or killed) by a Velociraptor during a transfer to the holding pen. Major construction comes to a halt on Isla Nublar leaving many structures unfinished until Hammond receives endorsements from outside opinions. It is at this time Drs. Grant, Sattler-Degler, and Malcolm are all approached to come and give their opinion on the park. June 11th/12th-1993: The events of Jurassic Park and Jurassic Park: The Game take place. It’s kind of a rough idea at the moment of the possible chain of events, but for the most part the new timeline does fit within the confines of the original film time line and makes an honest attempt to expand events we already knew or predicted from the films. We know that Dr. Sorkin’s lab is geographically cut off from the rest of the island with the capability of performing scientific research on the animals independently also and this is explained where she is during the events of the first film. One thing I think is cool about JP:TG is how TellTales shows us worker relations at Jurassic Park from radio station DJ’ing over the intercoms to company politics. It’s nice to see so much detail invested into this. Even the staff members name the dinosaurs and that alone is a plus point. If anything, InGen was more fleshed out as an actual business establishment instead of how it was portrayed in The Lost World: Jurassic Park as a greedy corporation. It makes InGen, as a corporate entity a bit more redeemable and realistic. It is shown that Isla Nublar has underground/maintenance access tunnels to move personnel, equipment and even supplies across the island. The tunnels themselves do not connect directly to the Visitors Center or Sorkin’s Lab just yet, but they are everywhere. This has been suspected for a while, but now it’s a confirmation that they do exist. As to when we’re including underground facilities on our map? That’s a discussion going on in staff at the moment. We also need to determine the path of the tunnels. This screen shot to the right is a good start to investigating map viability. We also know power is supplied to InGen’s operation on Jurassic Park via Geothermal Power, which is located close to Dr. Sorkin’s lab. The Results – Do we have a viable extension of the franchise? It is nice to see the adventure return to Isla Nublar in regards to a story continuation that makes itself consistent with the cutscene from the beginning of The Lost World: Jurassic Park. We know the cutscene is canon to the film series as it is constantly re-included in releases of the film on DVD/Blu-Ray and even television airings of the film. The entire adventure offered by TellTale does leave me feeling like we got that worthy Jurassic Park 1.5 to accurately explain what happened to Isla Nublar in the end. In terms of continuity issues what we are presented with aren’t terrible enough to discredit the game from placement within the film-canon universe. In fact, the issues are merely oversights or things that can easily be explained as flubs. Flubs themselves are present within the film series as well too from sequel to sequel ranging from changes in Velociraptor and Pteranodon appearances on down to small little prop issues here and there. The only two major flubs here with Jurassic Park : The Game are the issues with location placement per the TellTale version of the map, adding to the plethora of flubby maps, and Gerry Harding’s changed physical appearance. At the moment the “Jurassic Park: The Game” is in essence deserving to be included as a member of the S/F continuity family. The general consensus at the moment on that subject is that it cannot nor should it overturn the films canon of what’s already been established. In essence this makes it a supplemental canon as a result subservient to the film’s own canon “laws” of sorts, which it abides by throughout save for the few issues pointed out in this article. The issues present are seen as expansions of thought where an explanation for any continuity oversights can be found and applied easily onto the for retroactive continuity issues. Author intent does have a lot to do with the decision we make, but the facts way heavily upon the attention to detail within and we acknowledge we are not the official voice on this. We only analyze and report our findings! As to the point if anything TellTale’s venture in the JP franchise only expands and creates it’s own immersive story that yes leads you to feel like you’re directing an animated JP feature that expands the story. We know Telltale has honestly done their research and even it was stated to me back in February they were browsing the encyclopedia on the site here for information. So we know some of our own research helped them. It’s just a shame we didn’t receive a nod in the game’s credits for our research being utilized though, and that while regrettable is being made right from what I hear after speaking to them. TellTale though has paid close attention to us in their blog, facebook, and Twitter and we appreciate the coverage and working with them whenever possible to provide coverage. This had no determination or bearing on the status of the game and so allow me to say, professionally, this is not nor will it ever effecting our decision – what governs that is cold hard fact and data analysis involved. Once again, thank you TellTale for making a game that fits within the S/F-canon alignment. We look forward to expanding our own encyclopedia with information to bring more people to experience this awesome return to Jurassic Park.